The client was driving in his car with some friends when they were intercepted by police officers. On questioning, he told them without hesitation that there were drugs in the car, and where they were. The police officers arrested the client and began the process of conducting a search of his home. Upon attending the client’s home, officers found one of the client’s friends from earlier in his car removing a safe from his property. This was seized by the police. The police officers questioned our client, who made full admissions to trafficking, provided a code to unlock the safe, and took responsibility for the contents inside it. Police seized a total from the car and the safe of 130g of powder, pills and rock substance believed to be MDMA (ecstasy); 29.4g of powder believed to be ketamine; 44.36g of GHB; $3050.00, scales and small plastic bags. They also seized the client’s phone and found several thousand messages that showed him to be conducting trafficking operations. The powders found (suspected of being MDMA) were significantly over the 100g (pure) minimum weight specification for commercial quantity, however police did not get the drugs tested and therefore must have assumed that the MDMA was not pure. On a mixed quantity, police need to locate 500g or more to make a commercial quantity charge. Nevertheless, the client was alerted to the significant possibility of serious gaol term. The quantity of drugs found put the matter at the higher threshold of offending in the Magistrates’ Court. There is a term of maximum imprisonment of 15 years each for the trafficking charges alone. Following a summary case conference with the prosecution, the possession charges were withdrawn, and the proceeds of crime charges were combined into one charge. Unfortunately, there wasn’t much that could be done about the trafficking charges, due to the client’s detailed and thorough admissions to the police. 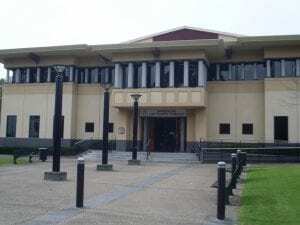 A plea in mitigation was made on behalf of the client at the Dandenong Magistrates’ Court. The submissions outlined the youth, immaturity and inexperience of the client, who was in his early twenties, with no prior charges or offending and had not been before a court before. The court was not impressed by this, and noted that the client’s business was very successful and professionally run. Further submissions were made that pointed to the client’s drug use. and the fact that this commenced following a stressful period in his life involving a dire family health situation. It was explained that when that situation created monetary concerns for the family, and they lost their home, the client began trafficking to assist with medical bills and household expenses. The Magistrate accepted that the trafficking was not to fund some form of lavish lifestyle. The court accepted that, due to the client’s circumstances (specifically his limited prior offences, and psychological report), he could benefit from drug and mental health rehabilitation. The client was then assessed for a Community Corrections Order (CCO) by Corrections Victoria. A CCO is a sentence that the court is able to hand down that can focus on the client’s rehabilitative and therapeutic needs, to ensure that they are given the help that they need with the goal of ensuring they do not come before the criminal justice system again. This can involve mental health assistance, drug and alcohol counselling and direct supervision from judicial staff in order to ensure compliance with the order. This order can be served in the community, with the client living at home or in a rehabilitation facility if required. The court requires Corrections to undertake an assessment before making this order, to ensure that this option would be appropriate for the client, and that they would be likely to respond to it and ultimately benefit from it. The client was found to be suitable for a CCO; however, the court expressed their wish to also impose a sentence of imprisonment. The court has the ability to do this, so long as the length of imprisonment is a total of one year or less. Further submissions were made, indicating to the court that rehabilitation should be the main sentencing principle. These submissions pointed to the client’s youth, honest and open co-operation with the police, admissions and the level of remorse indicated by the early plea of guilty. The court ultimately agreed and sentenced the client to a CCO with treatment conditions and community work conditions, without a period of imprisonment. This was a great outcome achieved by in-depth knowledge of the requisite sentencing principles each court is bound to consider in their decision-making.